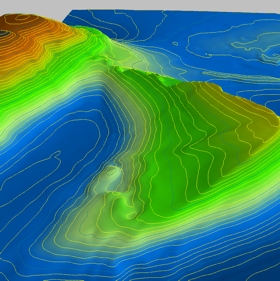 All LSS products will produce a triangulated digital terrain model (DTM). This triangular mesh is at the heart of everything we do in LSS and isn't even a separate command. 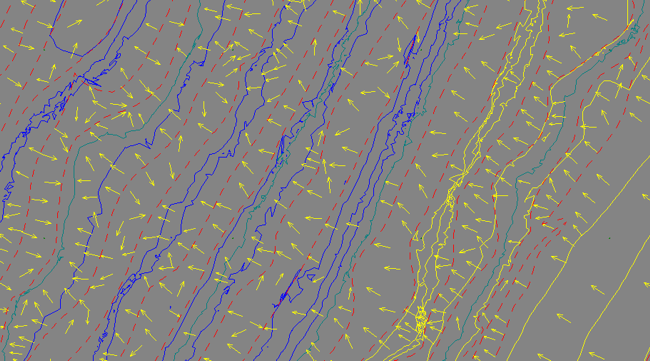 As soon as any data is loaded into LSS it is modelled. The user can then choose to display contours at any interval. The triangles and contours are dynamic and react instantly to changes to the points that make up the DTM. If the data from which the DTM was created contained feature codes (lines and coded points) then these can be set to be inside the DTM or not. One thing you may notice about LSS is that it automatically trims the DTM, so you're not left with loads of long, thin triangles on the outside of the DTM which should never have been created. Depending on your chosen LSS product, in addition to DTM creation, you may wish to report volumes, design excavations, calculate level differences etc. Please see the products section for details. DTMs created from radial EDM survey data remain tied to survey stations, so Traverse adjustment and setup changes affect the DTM in realtime. Slope arrows and lines forming breaklines in this DTM of a quarry. Subscribe to our newsletter for exclusive special offers and tutorials.